If you're the kind of person who thinks nothing of subjecting your precious photographic equipment to all manner of environmental peril, Nikon will soon release a brand-new advanced camera that promises to withstand the pain. 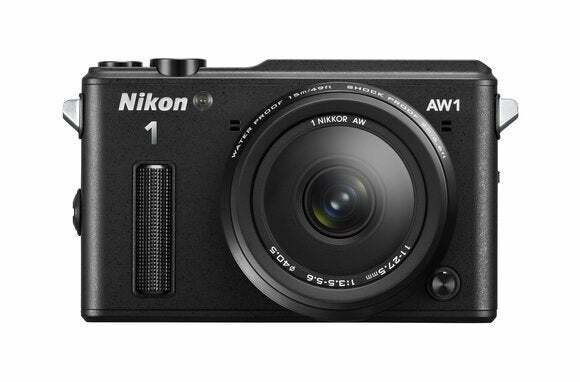 The Nikon 1 AW1 (AW for all weather), a hobbyist camera designed for adventurous travelers, families, and sports enthusiasts, is a cross between Nikon's rugged Coolpix AW110 point and shoot and the elegant Nikon 1 J3. For the first time, a compact interchangeable lens camera is waterproof, shockproof, and freezeproof in a reinforced body. Nikon says this model can dive underwater to 49 feet, freeze to 14 degrees Farenheit, and withstand a drop of about 6.6 feet. While small, with a minimalist Nikon 1 series design, the AW1 is nonetheless built like a tank, with a rugged stainless steel body weighing approximately 11 ounces. It's a little thicker than those models, and while slim, it's also a tad taller with dimensions of 4.5 (width) x 2.9 (height) x 1.5 (depth) inches. A built-in pop-up flash, all rubber and sealed on the inside, can also be used underwater. The Nikon 1 AW1 is waterproof, shockproof, and freezeproof—no need for protective housing. The camera is compatible with all nine of the Nikon 1 series lenses. However, the camera maker is also releasing two new Nikkor lenses made especially for this model. The 1 Nikkor AW 11-27.5mm f/3.3-5.6 lens with a 2.5 X (30-74mm equivalent) zoom, and the 1 Nikkor AW 10mm f/2.8mm lens are both rugged to the same specs as the camera. The other lenses in the line can be used with the camera under normal circumstances, but they cannot withstand harsh weather or environmental conditions. The camera has a new AW mount with an O Ring on the outside. The new lenses have a lip that covers the O Ring to guarantee that the connection is waterproof. The current 1 J lenses attach to the inside of the mount, while the rugged lenses attach to the outside. A silicone skin (separate purchase) provides a more ergonomic grip and stylish colors. For active sports, the camera also has GPS, an altimeter, depth gauge, and a virtual horizon on the display. It's Wi-Fi capable if you add Nikon's $60 WU-1b Wireless Mobile Adapter and associated apps for iOS and Android to transfer images and videos to your smart device and use it as a remote control for the camera. Borrowing from its fixed-lens Coolpix AW110, the AW1 has an Action Control button that lets you navigate through the menu by simply tilting the camera, handy for quickly viewing pictures and changing menu controls. You can also use the action menu to lock certain features—you don't want to accidentally activate an unwanted camera feature while you're skiing at 100 mph or persuading a stingray to pose for you. Camera with waterproof pop-up flash. The Nikon 1 has a 14.2-megapixel CX CMOS sensor, comparable to the Nikon 1 J3. Paired with the Expeed 3A image processing engine, the AW1's Advanced Hybrid Autofocus (AF) system lets users capture fast-moving action via the camera's 73-point AF array, which can lock action in about 80 milliseconds. It shoots 15 frames per second in burst mode at full resolution and autofocus, and 60 fps at full resolution if you lock focus on the first frame. The ISO range is 160 to 6400. 1 Nikkor AW 11-27.5mm f/3.5-5.6 lens. The Nikon 1 AW1 shoots Full HD 1080p video and can shoot video and stills simultaneously. A Slow View feature, designed for sports shooting, lets you press the shutter halfway to capture about 1.33 seconds of action for slow motion looped playback on the AW1's 3-inch, 921,000-dot LCD. A full shutter press then yields an image that may otherwise have been missed. This new rugged digicam also has the same creative features as the 1 J3—panoramas, selective color, miniature effects, night landscape, and three underwater modes, (standard, scuba, close-up). The Nikon 1 AW1 can compensate for lost underwater saturation with white balance controls that keep images vibrant, Nikon says. 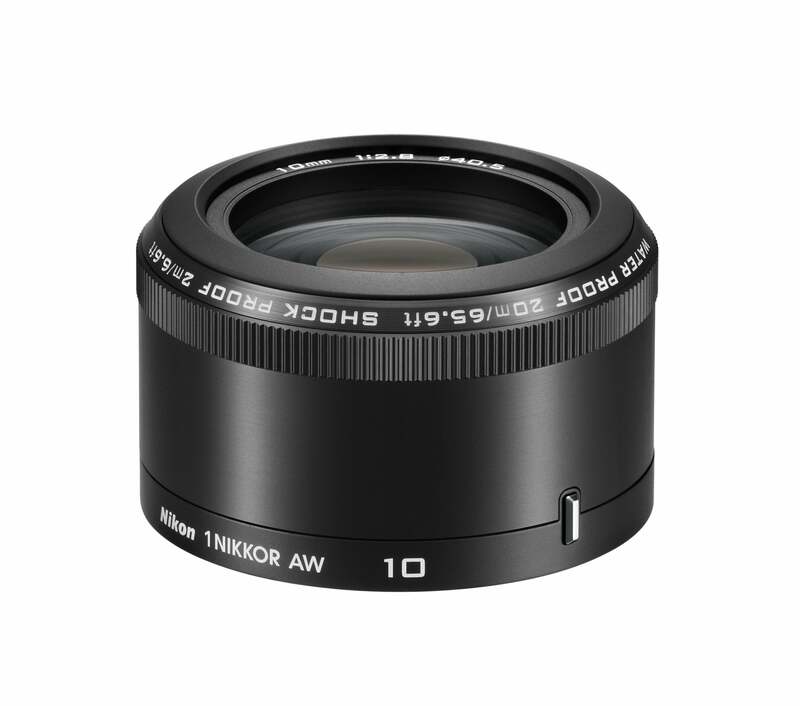 1 Nikkor AW 10mm f/2.8 lens. The Nikon 1 AW1 will be available as a one-lens kit with the new 1 Nikkor AW 11-27.5mm f/3.5-5.6 lens for $800. It will also be available in a two-lens kit with the 11-27.5mm f/3.5-5.6 lens and the 1 Nikkor AW 10mm f/2.8 lenses for $1000. Both configurations will be available in October in black, silver, and white. New accessory silicone skins will also be available in black, khaki, and orange for $37. A new Filter AW 40.5 NC attachment designed to combat condensation when switching lenses in extreme environments is coming next spring.